Green factor: No recycling or composting. Styrofoam containers. Long after the hip and cool gourmet food trucks that feed the downtown lunch masses have gone home for the day, their culinary forefathers – the old school chip wagons – remain. Permanently set up on the corner of Bank and Sunnyside in Old Ottawa South, I’ve stopped by Mr. Poutine a couple of times now while in the area. The bright yellow truck is oddly tall and has a short set of stairs for getting up high enough to see the guy inside and place your order. Their menu is actually pretty expansive, going beyond the typical fries/poutine/hotdogs/burgers of most of their peers. Their offerings include a club sandwich, chicken fingers, onion rings, a beef sub, and a donair sandwich. That being said, many of those items are likely coming out of a freezer. I kept things simple the first time around and went for a small fries ($4). Although I was ravenously hungry, I didn’t want to get a poutine and ruin the dinner I was supposed to cook when I got home, so the poutine and/or other menu items would have to wait for another day. I received my fries literally the instant I ordered them, so I figured that a guy waiting for a larger food order had effectively forfeited his fries to me while the other food cooked. Condiments and seasonings were located right in the window – which seemed awkward and inefficient – but as I only had fries and was trying them naked, it was a moot point for me. Sitting down at one of the weather-worn and ketchup-stained picnic tables in the same parking lot where the truck is set up, I tucked into my bag of fries. It was a pretty standard size for a chip wagon – a small paper bag filled to the brim with the thick-ish fries that seem to be de rigeur in Ottawa. Golden brown and crisp, these were tasty fries. They weren’t out-of-the-fryer hot, but I was glad because I could inhale them without fear of burning my mouth. Although I should have given them a shake of salt, they were still a solid chip wagon fry. 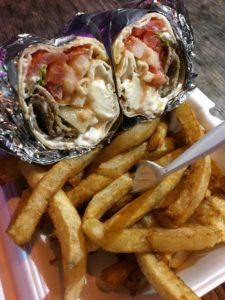 On my second visit, I decided to kill two birds with one stone – expanding both my knowledge of this food truck and of the local donair scene. 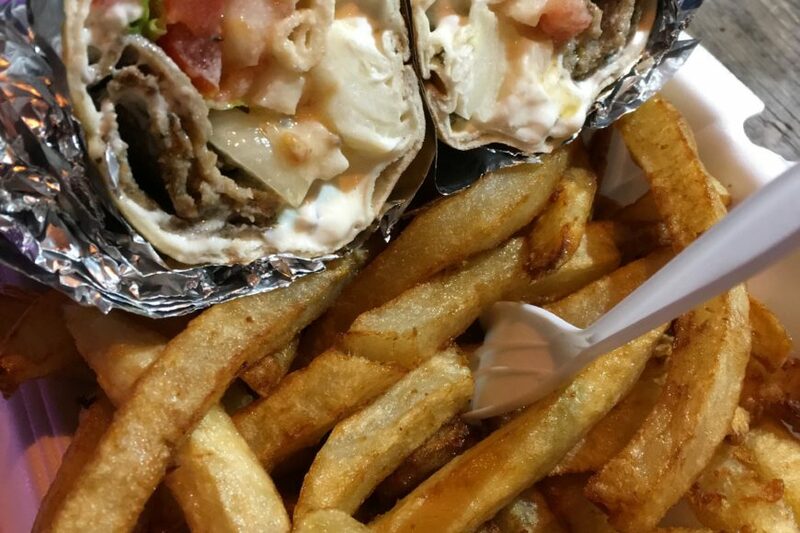 Their donair comes with fries, and is impressively cheap at just $8. I’m generally not positive about donairs in Ottawa, and my gut feeling wasn’t bolstered when the owner gave me an ever-so-slightly dubious response of: “You want a donair?”. Yes; sadly so, it seems. It took several minutes for everything to get cooked and assembled by the one-man crew, which was to be expected. Happily, there’s always good people watching in Old Ottawa South in the spring. We took our tray of healthy eats and set up shop at one of the picnic tables. For a split second, I thought the donair was looking good – it was foil-wrapped, saucy, and tomato and onions were prominent. Then I noticed the first bit of lettuce rearing its evil green head. It only took a few bites for things to go further downhill: pickles were also present, it had a garlic sauce instead of a true donair sauce, and the onions were in off-puttingly large chunks that were bitter when bitten into. I picked out a few bits of meat to try on their own, and they tasted vaguely like a generic donair, but my taste buds were too inundated by that hyper garlicky sauce and the onions to taste much else. While wraps here get finished in their foil on the flat top, the amount of sauce and veggies inside my donair made it too cool. In the end, even my ingrained sense of not wasting food couldn’t get me to finish this. My fries were plentiful and super hot, although not as crispy as they were the first time around. 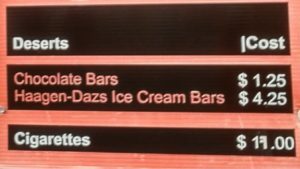 If you’re going to a place called Mr. Poutine, it’s probably best if you stick with their namesake item and avoid the random menu residents that don’t seem like they’d be ordered very often, because they’re probably gonna let you down. Desperate ex-pat Nova Scotians: it’s not worth the cheap sticker price, this is not the donair you are looking for. PPS. This is the first food truck I’ve ever seen that sells cigarettes (now $18).